The comfortable beds and clean rooms and the friendly staff. Great location, good swimming pool and very nice breakfast. Free computer in lobby. The rooms were very nicely furnished and the beds were pillow tops to die for! My experience with Fairfield was awesome, the pillow top mattress was delightful. We flew from Orlando to Nashville were we stayed in yet another Fairfield. The beds were awesome pillow tops. The 139-room Fairfield Inn by Marriott Orlando Airport is located five minutes from the airport and 20 minutes from downtown Orlando or Walt Disney World. The four-story non-smoking property, well suited to either the business or the leisure traveler, operates a 24-hour complimentary shuttle to the airport. Other items included in the room rate are high-speed Internet access, a hot breakfast buffet, local telephone calls, a morning newspaper, parking and coffee available in the lobby 24/7. The hotel has two meeting rooms for business or social functions. The larger can accommodate 80 guests. There are several golf courses a short drive away and Orlandos major shopping centers are a 20-minute ride. All the guestrooms have a work desk with high-speed Internet access, refrigerator, microwave oven, two telephones, coffee and tea making facilities, cable television with movie and news channels, VCR player, pullout sofa bed, iron and ironing board, alarm clock and a hairdryer. The bathtubs have spray jets. This inn has an outdoor swimming pool, whirlpool and a fitness center. There is a Bally Total Fitness Center five miles from the property. The complimentary breakfast is the only meal served here but there are several places to eat nearby including a Chilis, Bennigans, TGI Friday and Tony Romas. The 24-hour front desk has safe deposit boxes and information on all the Orlando events and attractions. Other amenities include a coin-operated laundry, copy and fax machines for guest use, vending machines and a dry-cleaning service. 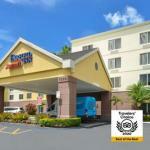 Convenient, clean, comfortable and cost effective: That was the opinion of many who used this Fairfield Inn at Orlando Airport. Several noted there were cheaper places to stay in the area but not all had the facilities of this property. There were good reviews about friendly and efficient staff, the complimentary airport shuttle and the free hot breakfast buffet with the famous Jimmy Dean breakfast sandwich. Many business clients use this hotel on a regular basis, which is a good recommendation.